Natural swimming pools create a peaceful setting, increase the value of your landscape, and maximize biodiversity. They also perform double-duty to give families the Best. Summer. Ever. With a focus on sustainability, ecology, and efficiency, many Boulder homeowners partner with Outdoor Craftsmen to achieve landscape beauty that is in tune with the glorious Colorado outdoors, that also delivers outstanding functionality and opportunity for enjoyment. Our expertise in designing and constructing natural swimming pools, and converting existing pools to be natural swimming areas, has made us the leader in offering this unique benefit to homeowners in Boulder and all around the Front Range. 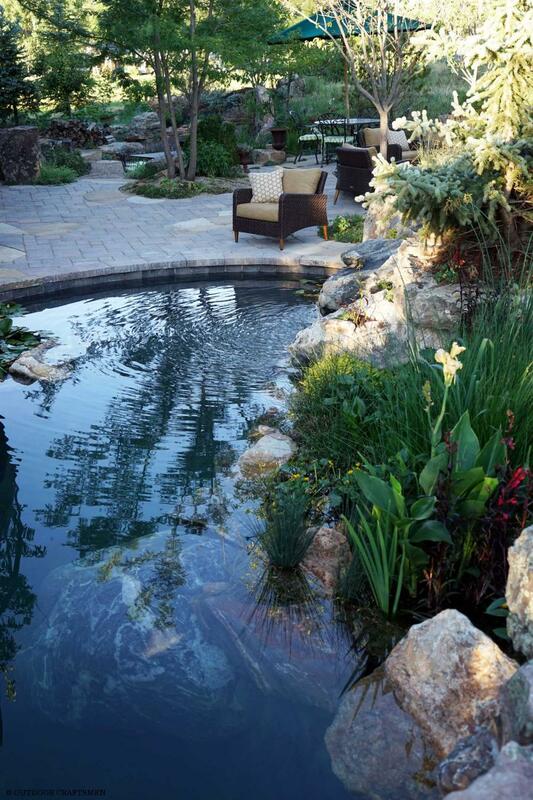 Envision a natural swimming pool in your Boulder landscape. Stay inspired. Schedule a natural swimming pool consultation today. If you love the idea of having a private area in your landscape to float, play, and swim, but thought this just wasn’t possible without the use of chemicals, think again. Natural pools offer an idyllic environment that is simple to own, naturally-filtered, and chemical-free resulting in low operating costs and easy maintenance. Natural swimming pools offer a space that is contemplative, reflective, and meditative - completely synchronized with the surrounding, living environment. Clear, sparkling water, which is not artificially blue and without an overbearing chlorinated odor, invite you to spend warm Boulder days floating in your own private oasis. By uniquely incorporating aquatic plants in a separate area in the pool, natural swimming pools benefit from a living ecosystem that serves as a virtually chemical-free water purification filter system. The pool is clean, fresh, inviting, and beautiful! Modern, natural water filtration exists in about 30-40 percent of the pool area depending on surface area and depth. By including landscaping and planting design into your pool, you can extend the beauty of your garden, add visual interest, and enjoy a pool that does not require expensive, chlorinated chemicals to keep it balanced. Just like a pond or natural swimming hole, during the Colorado winter your natural swimming pool will safely freeze and naturally hibernate until spring. Many run throughout the winter. The warming of the sun regulates the swimming pool temperature and will thaw the water and welcome you when the days lengthen and warm up. Pools can be formal or blend into the outdoor landscape; plus, we can convert existing traditional swimming pools to become naturally beautiful and beneficial swimming spots for you and your family! Outdoor Craftsmen are experts in the design and construction of natural, outdoor swimming pools. Call us at (303) 828-0408 or contact us to get underway with your landscape design and enjoy a natural swimming pool in Boulder this summer!